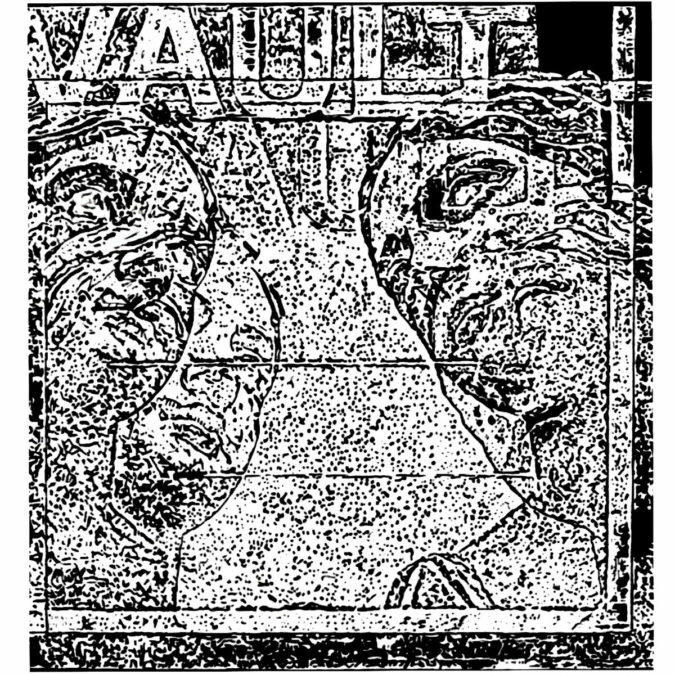 The Virginia based band VAULT recently landed on the public’s radar right properly with their 6-song self-titled début earlier this month. The band is one that I believe unquestionably qualifies to be termed a “supergroup”; its members’ pedigree of present and prior acts includes Backwoods Payback, Windhand, Alabama Thunderpussy, Snapcase, Corsair, The Mighty Nimbus, Hail Hornet, and more. VAULT is none other than vocalist Daryl Taberski, guitarist Asechiah Bogdan, drummer Erik Larson, bassist Dustin Perry, and guitarist Paul Sebring. Now, regain your composure and let’s open this VAULT and discover what lies within its holdings. With a roll call like the one here, it is a pretty safe bet that we will find something that is heavy at heart, caustic in contents, and diverse in scope. As sure as the sun is the source of daylight, those three very traits do indeed permeate each and every sonic fiber stitched into this amalgamation of crusty, fuzz metal doom and blackened sludge. “Hatchet” is the first track to hack its way into your head, as muddy riffs rip forth, quickly accompanied by chaotic grooves and crushing drum patterns. Aggressive vocals, ones made even more volatile by their subdued placement in the overall mix, express from their disinterred state. Then there are those solos, fiercely wailing like some bluesy air horn submerged in a bog of quicksand. We are cooking with fire now, fuckers, as audible arrows like so many metallic barbs fly from “Crooked Quiver“. Quite rhythmically, they thrust themselves about, thick and chunky they bobble to and fro, as the tune statically crashes in our midst like a bull in a china shop. Oh, where shall we go from here? Ever further in, of course, digging deeper and deeper as we reach “Bell Krater“. This shortened slab of psych-rich, sludgy doom is what I would imagine an overdosing Tony Iommi would sound like in the last moments of a death knell… expressed with guitar in hands. All the while, pummeling and pummeling rhythms hammer away, while effectively trippy vocals meander. At this half-way point, we get our first real breath of melodic atmosphere with the brief, acoustic-tinged “Memorial Machine“. Enjoy it, breathe it in, because the audio bred battery is about to return with “Blindfold“, a revealing observation of ordered density. Frothy riffs thick with fermenting agitation exert themselves over and over, leaking as the drum kit’s cadence keeps things on point. Another break in this transpiring deluge of sinister sludge as the start of “Weeping Willow” unfurls with a bit of slow ambiance at first. Yet soon enough, things explode with a barrage of instrument-borne intonation, the song’s lumbering advance driven by compelling riffery. To me, this is the band at their most psychedelically experimental, as the verses are stripped down to the vocal and immensely trippy nuances, though eventually giving away to heaviness. Definitely my personal favorite, the song’s circular spirals of sedation-then-explosion repeat and repeat beneath some otherworldly vocals. There you have it! A detailed map of the self-titled VAULT EP, from me to you, to get you started in exploring this chamber of doom. Its onerous mass a grave structure, a tomb-like cavity where a sort of subterranean sonic treasure lies laden with riff jeweling and hellishly precious, sluggish rock. Check it out for yourself in the stream provided in this review or saunter over to Bandcamp for further streaming and purchase options HERE. One last thing, VAULT are seeking record label representation / distribution, any interested parties can contact the band via their Bandcamp page or any of the individual members directly.